Nurturing facial skin is our daily mission, but we often forget the importance of cleanliness of makeup kit. 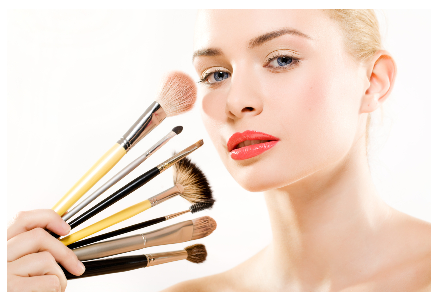 The brushes are essential tools for flawless makeup application, but how they can be useful for embellishment, so they can be harmful if not maintained properly. In fact, on the delicate fiber brush absorbs dead cells and natural oils from the skin, dust and layers cosmetics and creating the ideal conditions for the propagation of bacteria, which are blamed for clogging the pores, acne, irritation and redness. 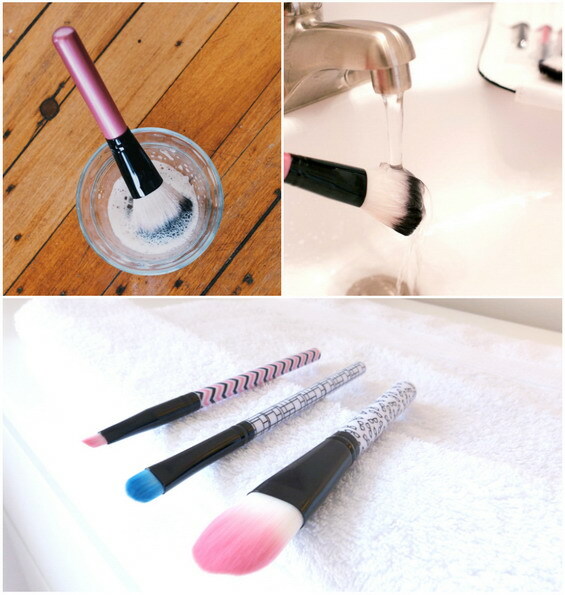 Clean brushes for makeup, clean face. The truth is that most women extremely rarely clean brushes. The good news is that this task can be completed in a short time, and you do not need special tools for it (everything you need can be found in your home). WITH WHAT YOU CAN CLEAN BRUSH? It is best to use baby shampoo, but no problem to use an ordinary shampoo. In a small bowl mix a little shampoo with warm water. Once dissolved shampoo, soak brushes and mix them through the solution. Massage brush gently with your fingers. Most women use this method to clean because it is the simplest. In a small bowl, mix equal amounts of shampoo and cold pressed olive oil and add a little water. Olive oil helps to regenerate hairs. Mix with brushes through the solution and massage them occasionally. This method is recommended for cleaning brushes for eyeliner, greasy eye shadow and lipstick. Place a few drops of dishwashing detergent on a soft clean sponge. Spend gently with a brush moistened the surface of sungjercheto, making a circular motion, then rinse with lukewarm water. Repeat 2-3 times. Dishwasher detergent is antibacterial and deeply removes oils and residue from makeup. Regardless of which of the offered cleaning solutions you choose, to store brushes in good shape is important to follow the following advice. 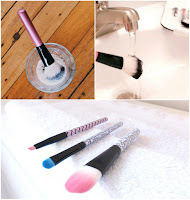 ~ Initially place the brush under running water to remove most of the remnants of makeup. Be careful not to handle water and brush to be directed down the fibers remain in the correct position. ~ Once you clean the brush with some of the solutions and will wash off with warm water, gently press it to drain the water. At this point fingers flatten the fibers so they don't lose its original form. ~ Lay the brushes to dry on a dry cloth or kitchen paper. ~ Place the towel to brush the edge of the table or next to the sink to brush hang rather than remain flat on a towel. ~ Let the brushes to dry naturally. It takes about 10-12 hours. HOW OFTEN IS RECOMMENDED TO BRUSH CLEANING? The answer depends on how often you wear make-up. Brushes for concealer, liquid powder and lipstick should be cleaned at least once a week, because moisture accelerates bacterial growth and easier keeps dust and dirt on the fibers. The other brush is best to wash once a fortnight, but many experts agree that it is enough and once a month.